A photo-call for the participants and facilitators at Fort Alice. TO the naked eye, a decrepit building, overgrown with weeds and eaten away by mildew and dampness, and on the verge of crumbling into pieces, is an eyesore that should just be demolished. Not many bother to find out the history of such a building — why it was abandoned or used as a drug den or served as a nest for varmins — rats, snakes and mosquitos. But for two men, such relics of a bygone period are worth saving from the wrecking ball — their identity and sense of belonging and a part of them that cannot be destroyed. One is an architect in Kuching, Mike Boon while the other, Dr John Ting, an academic at the University of Canberra, Australia and Assistant Professor of Architecture. Both have worked together to restore old but historically significant buildings and conserve them as ‘heritage’ sites for posterity in the state, most notable of which being the Old Courthouse in Kuching and Fort Alice in Sri Aman. Boon graduated in 1990 and returned to Kuching and worked in a firm with a staff of five to six people. For the first two to three years, he was only given simple work like toilet and tile designing — then the usual coffee breaks and discussion on what he had done for the day with a senior before leaving the office. The following three years, he did building designs and drawings and wrote specifications and letters while the office staff grew to 10 people. Subsequently, he became a junior partner of the firm for five years and as things got busier, he helped the staff settle design issues and could only clear his own work at 5pm when the staff knocked off for the day. He then got promoted to a management role, marking, as he called it, the beginning of his ‘terrible’ 10 years. He spent the day either going to the site or attending a lot of meetings. For the next five years, it got even more hectic because once he reached the office, he was like a general practitioner — everyone waiting for him to give instructions on what to do. What he did was sketching the designs on paper, transferring them onto the computer, working through lunch to clear his tray, communicating with other consultants and contractors, writing letters, attending meetings, and finding time to talk to partners. Despite the tight schedules, he said seeing things getting built brought him job satisfaction. Among the projects he is proud of are the Toyota 3S Centre in Sibu and Fort Alice in Sri Aman. 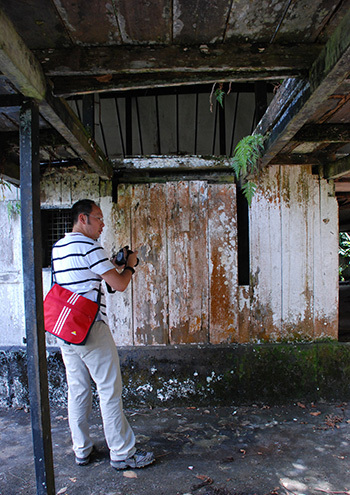 John Ting taking photos at Fort Alice before conservation works started. — Photo by Mike Boon. Fort Alice was built after the settlement in Skrang. Prior to that, Fort James, built in 1849, was frequently flooded and a new settlement was sought. Rajah Charles Brooke decided to move the settlement downstream and Fort Alice was built there in 1864. The settlement area was then known as Simanggang (now Sri Aman). Restoration of Fort Alice started on May 28, 2013. 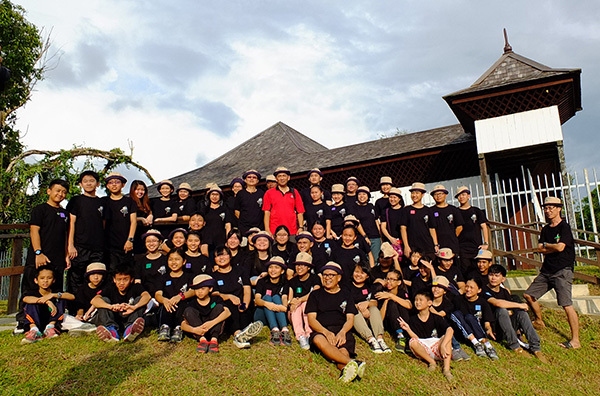 “As a significant landmark in Sri Aman, it was only right the local community had a say in the restoration process so that they could tell the younger generation about its significance,” Boon said. The process involved six local school teachers and facilitators and over 30 students from primary five to form four, making Fort Alice a plaform for promoting the preservation of historical places. “The restoration started with dismantling the entire fort and rebuilding it back to original. During the dismantling process, the students were brought on site to see for themselves the work being done on the ground as well as for hands-on experience. “By live participation, it is hoped one day they will initiate a voluntary group to preserve historical treasures. At that time, Boon and a University of Melbourne PhD candidate, John Ting, who was doing a research on the fort, found each other and they shared their research. Ting found a photo, dated 1875, by Alexander Hill Gray, kept in Stonyhurst College in the UK. According to Boon, it’s the earliest photo known of Fort Alice. “With that photo and a few others, we then had a better idea of how Fort Alice really looked like and how it was used before. “It also told us how to conserve the fort and recreate the interior rooms. All the restoration works were based on photograhic materials, literature and written documents so that we could show visitors how the fort was used and the living parts we were recreating,” Boon explained. He pointed out that gathering information was slow and painstaking because a lot of it was not in Sarawak, despite the fort being located in the state. Most of the information was found in Oxford University and Cornell University, some in Australia and some in private collection. 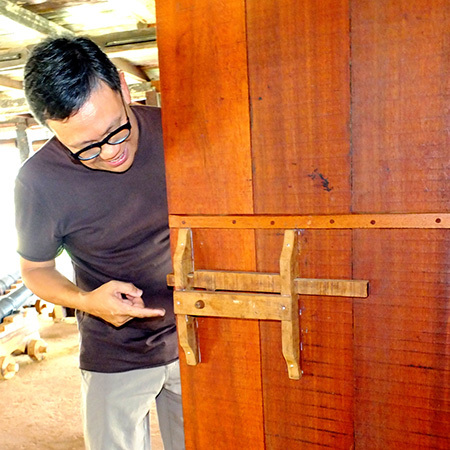 Boon also met a retired carpenter, Ting Nik Sing who understood what they wanted to achieve, is very experienced in the traditional joineries used, and had also worked with local historian Goh Kaw Sze. “All the works done are documented in an archive, the good, the ugly and the mistakes. Documentation is important so that in future, people may be able correct any mistakes, especially in conservation works,” he said. He added that even after the Fort Alice project was completed and handed over last year, and when he went back to Sri Aman a few weeks ago, the fried noodle stall operator and chicken rice seller still remember him — and he was touched. “It’s not about the money but people’s hearts … so sincere. I’m proud of it and treasure the time spent — 18 months, all worth it. But not all jobs can be like that. “I can only do it because I love doing it. It’s my hobby and also profession. I eat and sleep architecture. As a student, I brought my sketching pad even to the toilet, and did a lot of thinking during long showers. Mike Boon showing the traditional lock mechanism. There were bitter-sweet memories but on the whole, he is very happy with Fort Alice because through the restoration project, he got to fulfill his social responsibilities as well as give back to the community by engaging with the younger generation. “We always encouraged them to think rather than telling them what to do — unlike in schools where they were usually spoon-fed.Hopefully, it will help them make informed decisions and choices. “They gained experience through exposure to things they had never been through before. But we were not making them into carpenters. When they spent the night in the museum and talked about their experiences, it was very touching. They even asked what happened next and I told them it was up to them,” Boon said. John Ting first met Boon when his cousin in Sibu asked him to design a house in 1998. He found Boon ‘very helpful and generous’ and gave him the plan of the house. Later, while Boon was carrying out conservation work on the Old Courthouse, Ting was also doing his first research paper — coincidentally on the same building. It was a fast tracked project and the duo continued to research the Old Courthouse together even after the project was completed. Ting told Boon there were certain things he could not figure out by looking at the building. Ting said they were very lucky the Fort Alice project was delayed — from 2006 or thereabout to 2012 — because during this time (2007) he had started his PhD and had a lot of information about the fort. “Luckily, a lot of the information came from my PhD. And when Boon got the (Sarawak) Museum commission, he made sure I had enough time to go and do the research,” Ting recalled. Fort Alice was the first ‘architect in association’ project between John Ting Architect and Arkitek JFN. They worked together. Ting said he had been to Fort Alice around 15 times even before the project started. During that time, Boon was building Taman Panorama Benak, right next to Fort Alice, and he would go off exploring the fort. 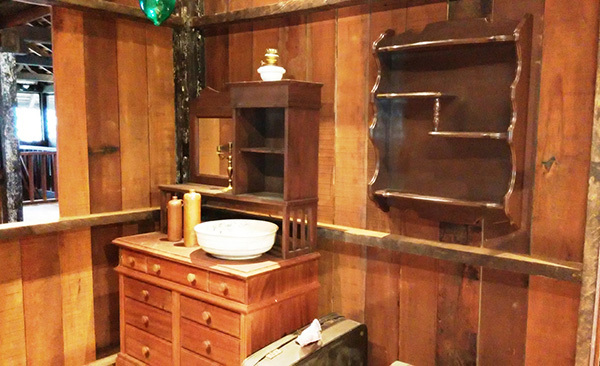 Aside from swapping information, Ting was in charge of the exhibition design (panel and text) and recreation of the two rooms of the fort, including reproducing the furniture of the relevant period. Asked about his research topic, Ting said it was architectural history, and conservation was an opportunity to apply the topic. “When you conserve a building, you not only make changes physically to bring it back to a certain period but also know what is the building’s history in order to decide where you are going to take the building back to. Fort Alice was first a defensive fort, then offices, residences and even barracks. Ting explained: “We decided to take the fort back to 1875 because we had good information on the building during that time. It was the best representation of the building, and also, we were turning it into a museum — the requirements of the museum could be accommodated in the 1875 version of the building. A recreated room complete with reproduced furniture of 1875. Asked if he planned to conserve only buildings in Sarawak, he said his passion was mostly in timber buildings in Southeast Asia or timber buildings originating in Southeast Asia, 19th century timber buildings and Sarawak buildings but also expanding to include 20th century timber buildings in Sarawak. Citing an example, he said although the Singapore Cottage Melbourne was built in the Island State, it was taken apart, boxed up and sent to Australia. On the buildings he regretted not having a chance to save, he said: “Yes, I don’t have the power to save them. I could try and influence the decisions on whether to save or lose them. But in many cases, this was not part of the decision-making process. If the decision had already been made, then there was not much I could do. For example, the Treasury Building built in the 1950’s at Barrack Road was demolished to make way for the Waterfront Hotel. It was a very important building in terms of Sarawak’s architectural history but by the time it was known that it would be demolished, it was too late to change the decision. “In that respect, the Sarawak Heritage Society at that time was very active in trying to save buildings. So I did what I could to help the Society do its work in establishing the historical significance of the buildings,” Ting said. So what he can do is immortalise the buildings in his book — The Architecture History of Sarawak before Malaysia. Ting was commissioned by Pertubuhan Akitek Malaysia Sarawak Chapter in 2009 to write the book which will be published next year. The book analyses critically the architecture and settlement patterns of Sarawak from ancient times to when Malaysia was formed.